Status: Contest finished on 15-04-2010. Here comes the second remix contest by Vim Cortez. This time is sponsored by Admiral Quality so you can win a Poly-Ana Vsti, in addition to a digital release on Intelligenix Records. The track to be remixed is “Just One Ping“. Good luck. here’s a new remix contest sponsored by Admiral Quality with some cool prizes to win ! 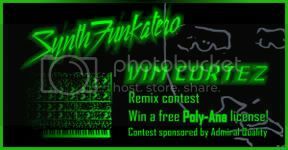 Remix “Just One Ping” (original can be heard on the player in the sidebar) and get a chance to win Poly-Ana, an awesome virtual analog synthesizer in VST format, by Admiral Quality! In addition to this and as for the previous contest, the winner may find his or her remix featured on an Intellegenix digital release!